At Edmiston and Colton Law Firm in Billings, Montana, our mission has remained consistent since our foundation in 1987: We represent injured Montanans in personal injury claims against large corporations and insurance companies. Our goal is to get fair compensation for victims of negligence. That negligence can come in many forms, from car accidents to oil field accidents. No matter what type of personal injury a person has suffered or how it happened, our goal remains the same. At our law firm, we have an impressive record of achieving that goal, having recovered millions of dollars of compensation in the form of settlements and verdicts for injured Montanans. Our personal injury lawyers comply with Montana's Rules of Professional Conduct. Throughout your case, we will provide experienced guidance, but will ultimately abide by your decisions. As we move forward, we will keep you informed of all progress. You will always have access to your lawyer. 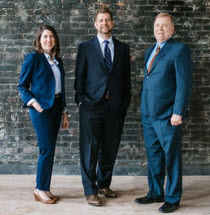 When you enlist Edmiston and Colton Law Firm, you can be confident that your case will get the personal attention it deserves.